Jacob Sampson and a small ensemble cast bring to life the boxing world of 1910s and 20s; the danger and reward of surviving by your fists, and breaking the mold society has set for you. Chasing Champions takes you on the journey of Sam Langford's boxing career. It also uses flashback and a flexible timeline to explore the fighter’s life as a child growing up in Nova Scotia and what forged him into one of the greatest fighters who ever lived. Chasing Champions is a physical experience that brings the audience into training and the ring, from the corner to the mat, and pays tribute to a great man who was almost forgotten. 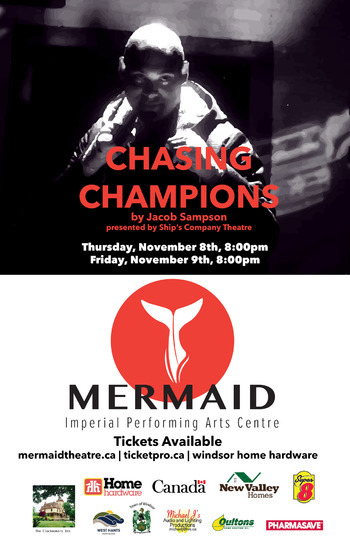 Chasing Champions was created by Ship's Company Theatre in 2016 and went on to win six Theatre Nova Scotia Merritt Awards, including Outstanding New Play and Outstanding Production.